April 3, 2017, 9:23 PM · In an effort to promote the coverage of live violin performance, Violinist.com each week presents links to reviews of notable concerts and recitals around the world. Anne-Sophie Mutter performed works by Mozart, Currier and Respighi, in recital with pianist Lambert Orkis. Chicago Classical Review: "Her long partnership with Orkis was evident in the conversational ease of their playing. Mutter’s tender expression conveyed the inward introspection of the (Mozart) Andante with a trace of melancholy, dexterously avoiding gilding the lily. Orkis’s stylish keyboard work was fully equal to his glamorous colleague and the cheerful vivacity of the finale was wholly delightful, the contrasting episodes given their due yet kept within Rococo parameters." Anne-Sophie Mutter. Photo by Bastian Achard. Hilary Hahn performed works by Beethoven, García Abril, and Bach, in recital with pianist Robert Levin. Fort Worth Star-Telegram: "For me, the highlight of the evening was Beethoven’s great 'Kreutzer Sonata,' which was full of both drama and beauty. Levin was a full partner, with Hahn a lyrical presence (the slow movement seemed downright magical). The violinist’s elegance and security were constant throughout the evening." Arts ATL: "It was an engaging, persuasive performance of three stalwart classical works and two freshly contemporary ones." Boston Globe: "In the (Mozart) second movement Adagio, Hahn seemed to be painting a long mural in sound, each phrase a thoughtful continuation of the previous. Laying full foundations for Levin’s cascades and flights in the final theme and variations, Hahn seemed to be playing collaborative violin as often as Levin was playing collaborative piano." Renaud Capuçon performed Lalo’s Symphonie espagnole with the Boston Symphony Orchestra. Boston Globe: "French violinist Renaud Capuçon showed off his incredible technical prowess and keen sense of dramatic tension in Lalo’s 'Symphonie espagnole.'" Jeff Thayer performed the Stravinsky with the an Diego Symphony. The San Diego Union-Tribune: "In chamber music-scaled sections, when Thayer could play mini-duets with one or a few players, everything fell into place. His fine-grained playing was, as always, technically superb, vanquishing dizzying leaps and finger-breaking string-crossings. Only one thing was missing: a full projection of his immaculate sound into the hall." Nicola Benedetti performed Bruch's Violin Concerto No. 1 with the San Francisco Symphony. The Berkeley Daily Planet: "Playing a 1717 Gariel Stradivarius violin, Nicola Benedetti gave a ravishing account of Max Bruch’s gift for writing beautiful music for the violin." Patricia Kopatchinskaja performed works by Webern, Schumann, Bartók and Ravel, in recital with pianist Polina Leschenko. Financial Times: "She made this well-whipped warhorse (Ravel's 'Tzigane') seem new, mischievously stretching out the tempi during the gradual crescendo, and making the most of the work’s false starts." Tamsin Little performed works by Ireland, Franck, and Monti, in recital with pianist John Lenehan. 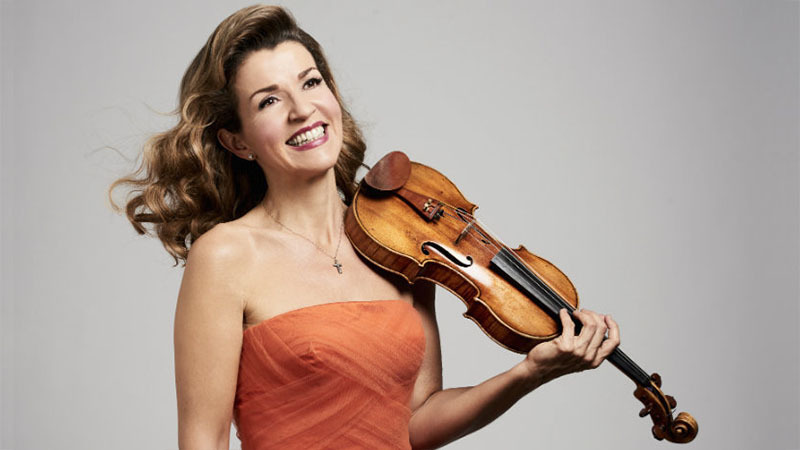 Gazette: "Tasmin treated us to a breathtaking display of impassioned violin playing, her rich tonal palette wonderfully evoking the varied moods of the music."